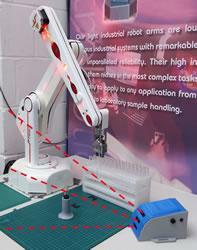 03/27/13, 10:31 PM | Industrial Robotics | ABB Inc.
An Arial rescue robot named Pars is being developed at RTS Lab. 03/26/13, 07:02 AM | Industrial Robotics | Velodyne Lidar, Inc.
Velodyne LiDAR demonstrates the use of LiDAR applications in 3-D mapping, autonomous driving and surveillance/security at NACSA's "Beyond Semiconductor: The New Trend of Technology." OceanWorks International is pleased to announce the successful re-deployment of the VENUS coastal network in the Strait of Georgia. In response to the failure of a power connector on the VENUS array in early fall 2012, a joint team of engineers from OceanWorks International (OWI) and Ocean Networks Canada (ONC) spent a week (Feb 5-9) aboard the vessel CS Wave Venture recovering, repairing, testing and re-deploying the network. "We can almost see a need for every type of UAS, from large to small," said Robbie Hood, the director of NOAA's Unmanned Aircraft Systems Program.